TOKYO (Aug. 24, 2018) – As a worldwide partner of the Olympic and Paralympic Games, Toyota Motor Corporation is supporting Para sports and contributing to creating a more inclusive society at the grassroots level, as well as through cooperation with The Tokyo Organising Committee of the Olympic and Paralympic Games (Tokyo 2020 Organising Committee) and the broader business community in Japan. During the upcoming Paralympic Games, Toyota will encourage further interest in Para sports around the world while providing “Mobility for All” solutions. Toyota is supporting the Paralympic movement through internal activities involving its employees, and by working in partnership with Tokyo 2020 Organising Committee and the All Japan Business Committee. 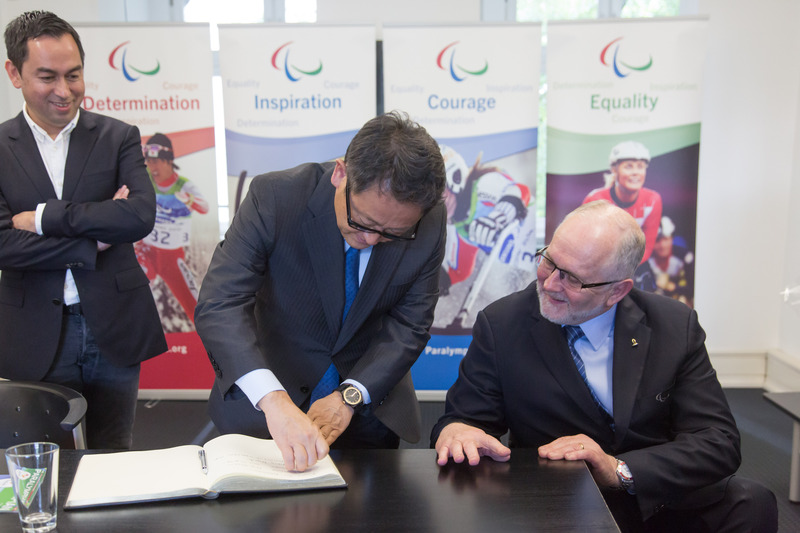 When signing the agreement to become worldwide partner of the IPC, Toyota also signed an agreement to become a partner to approximately 180 local National Paralympic Committees (NPCs). Working closely with each NPC, Toyota aims to increase and develop interest in Para sports globally. Toyota is challenging itself to develop equipment for Para athletes with the technological capabilities and engineering know-how learned from making cars in America, Japan, and Germany. For the PyeongChang 2018 Paralympic Winter Games, Toyota worked with other equipment developers and athletes, including alpine skier Taiki Morii, on the development of a new chair ski, and cross-country skier and biathlete Andrea Eskau, on the development of a ski-sled with Toyota Motor Sports GmBH. Looking ahead to Tokyo 2020, Toyota R&D employees are forming project teams to take on the challenge of improving equipment used by athletes in the summer para sports. The Agitos Foundation, the IPC’s development arm, is the leading global organization for developing Para sport as a tool for changing lives and contributing to an inclusive society for all. It works with NPCs and other organizations around the world. The worldwide partnership agreement between Toyota and the IPC has made it possible for the Agitos Foundation to deliver a program called “NPC Development Programme powered by Toyota”, which offers support and training in the areas of organizational development, sport technical training and athlete development. The objective is to increase the organizational capability and professionalism of NPCs so they can better expand the reach of Para sports in their countries. In various countries, working closely with the NPCs, Toyota aims to expand interest in Para sports by working with local populations and by connecting local businesses to each NPC. Toyota became a gold partner of the Japan Boccia Association in May 2017 and the official sponsor of the Japan Wheelchair Basketball Association. With these two partnerships as a focal point, Toyota will help increase awareness of Para sports by hosting experiential events in regions in Japan, providing operational volunteers, and by having Toyota employees attend local Para sports events, supporting the athletes, especially those where Toyota employee athletes are competing. Additionally, Toyota is sponsoring other major international Para competitions, such as the 2018 World Para Swimming European Championships held in Dublin, Ireland from August 13-19. Toyota already employs and sponsors a large number of athletes, both within and outside of Japan, including Para athletes. In addition, Toyota is exploring how it may employ more Para athletes around the world. As a separate entity, the Toyota Mobility Foundation is currently running a global idea contest, the “Mobility Unlimited Challenge,” aiming to develop innovative assistive tools to help provide the freedom of movement to those with impairments. The challenge was issued in November 2017, and the winning idea will receive up to $4 million USD in development support. The winner is scheduled to be announced at Tokyo 2020. Toyota is engaged in activities with various stakeholders and local communities in Japan to support the movement of people with limited transportation options. With a declining population, the people in Yokota City are seeing reductions in the scheduled bus routes they rely on. To maintain these routes, Toyota is providing assistive vehicles (WelCab) at no cost. The vehicles are driven by paid volunteers over the age of 60, operated by the city, and service six small towns in the area. By participating in activities to maintain routes in the area and working with local authorities and residents to help provide alternative ways to move from place to place, Toyota is able to contribute to local needs by exploring potential solutions to mobility problems. Similar activities are currently being considered for additional regional/rural towns and villages within Japan. Toyota has started working with train operators in the Kanto and Chubu areas of Japan to implement barrier-free options. Toyota is using the know-how and experience it has gained from its own systems at its factories to improve accessibility at public transportation locations. Toyota’s Japanese dealers across the country are participating in the “Everyone’s Medal Project” promoted by the Tokyo 2020 Organising Committee in cooperation with the Ministry of the Environment and the City of Tokyo. The project aims to make 5,000 gold, silver, and bronze medals for Tokyo 2020 by collecting and recycling metal from small and portable electronics. To do this, Toyota will be placing return/recycling boxes at more than 6,000 Toyota and Lexus dealers and Toyota Rent-a-Lease dealers nationwide starting from September 2018, where people can bring in their old portable electronic devices such as unused cell phones, etc. and contribute to a sustainable society. For Tokyo 2020, Toyota will be supporting and promoting volunteerism in various ways, including offering hundreds of dealer, group company, and its own employees the opportunity to participate as games volunteers for the Games. To support the Games, the business community in Japan created the "All Japan Business Committee" with the objective of creating legacy for Tokyo 2020 and the future after the Games. The group is the coming together of three Japan economic/business organizations: the Japan Business Federation, the Japan Chamber of Commerce and Industry, and the Japan Association of Corporate Executives. Akio Toyoda is supporting the effort by chairing the Committee which is encouraging the participation of companies large and small nationwide in cooperation with state and local governments and civil society. Toyota and the All Japan Business Committee will deepen understanding of Para sports by creating opportunities for people to meet athletes and experience their sports. There have already been more than 2,500 people from approximately 280 organizations that have participated and been connected directly to the nationwide movement, and Toyota athletes or staff took part in all of them. Progress is being made regarding efforts to create a barrier-free map, based on open data gathered on information collected around town by company volunteers. As of July 2018, information about barriers has been gathered from 12 cities around Japan at 54 companies. From last year, Toyota has been conducting barrier-free training, and has encouraged employees to participate in cities’ activities in roles as operational staff and/or volunteers. Providing venues and volunteers, Toyota has supported activities of the All Japan Business Committee-run “Japan City Expo,” an exhibition of products from businesses held in cities through Japan to promote the attractiveness of Japan based on the themes of traditional culture and Olympic revival. The All Japan Business Committee, working together with the chambers of commerce and industry in major metropolitan areas nationwide, has held exhibitions in six metropolitan areas in Japan with the theme of supporting the revival of these regions hit by severe natural disasters in recent years. Since July 2018 volunteers offered by approximately 300 organizations and companies, including Toyota, have participated. The All Japan Business Committee has gathered the latest cutting-edge technologies from across Japan that will support Tokyo 2020, and has opened a joint technology business “COUNTDOWN SHOWCASE” exhibit together with Japan’s Ministry of Economy, Trade, and Industry. The exhibit highlights 40 small and medium-size companies in Tokyo. Toyota exhibited its Mirai fuel cell electric vehicle and its Human Support Robot (HSR) designed to support human lifestyle activities. Toyota became the official worldwide mobility partner of the Olympic and Paralympic Committees in 2015 for the 2017-2024 period, covering the Olympic and Paralympic Winter Games PyeongChang 2018 (South Korea) and Beijing 2022 (China) and the Olympic and Paralympic Games of Tokyo 2020 (Japan) and Paris 2024 (France). As a partner, Toyota aims to encourage creating a peaceful society without discrimination through sports and is committed to creating a sustainable society through mobility. Toyota's values of continuous improvement and respect for people are shared by The Olympic and Paralympic Games, which brings together the entire world in friendship and solidarity to celebrate the highest realization of human potential. Toyota believes that mobility goes beyond cars; it is about overcoming challenges and making dreams come true, which is encapsulated in the company’s “Start Your Impossible” corporate initiative and is the basis for its transformation from a car company to a mobility company. When you are free to move, anything is possible.